Once your piece has been rough sanded and washed with a dilution of 3 parts water and 1 part SCR it is ready for slurry. 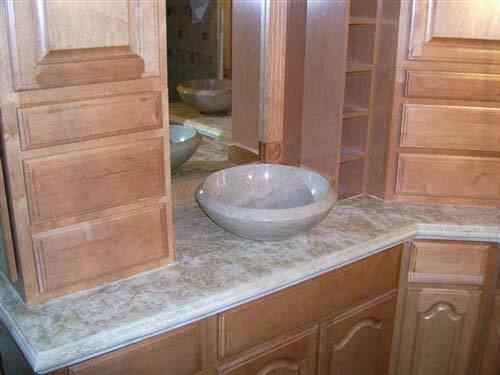 The idea behind the concrete countertop slurry is to quickly fill holes, voids and veins. The best tool for the application of slurry is your hand; most tools merely cover the holes and don’t fill them. NOTE: It is important to “fill” the hole so pressure on that area at a later date doesn’t cause it to reoccur. During the application process, try to leave as little material behind on the surface of the piece as possible; this excessconcrete countertop slurry material will have to be sanded off later. Do not try to use a damp sponge or wet rag to remove excess concrete countertop slurry, this will only result in removing material from the voids and cause a depression in the area of the void. Instead, wait for concrete countertop slurry to dry, this usually takes an hour or so depending on environmental factors and sand the excess off with a 400 grit sand paper or diamond pad. NOTE: All sanding should be done with out the use of water.